Herewith, reader peoples, is my BlogHer opus. Once again, this year I did not do anything particularly crazy (unless you count seven cups of coffee in one day). This time around, Britney Spears didn't even come up once. But still, I had a wonderful and wonderfully weird time. Wonderful! Along with Julia Roberts from Support for Special Needs, I organized a "Birds of a Feather" luncheon for moms of kids with special needs. (Er, "organized" is a bit of an exaggeration—I got a clipboard, I wrote down the name of the luncheon, I paid back Julia for one of the gift cards we gave away). I thought maybe 15 women would show up; we were twenty-five plus women strong, the biggest Birds of a Feather lunch group of 'em all. We were a veritable FLOCK. I can't even tell you how absolutely amazing it was to have everyone together including Kate from PixieMama, Janis from Sneak Peek At Me, Juliette from Global Citizen, advocate Catherine Calhoun, Kim from Autism Twins, Joanna from My Mom Shops, Shannon from Squidalicious, Jen from Into The Woods, Living Deliberately, Melissa from The Betty and Boo Chronicles, Beth (aka Niksmom) from Maternal Instincts, and Jean from Stimeyland. I wish I'd had time to talk more with everyone, but I bopped around like a headless tofurkey. Please, let me know if you were there, too, so I can feel even more guilty for not chatting with you. Weird! The e-mail that showed up from Dave at 10:00 p.m. on Saturday, while I was at a party. It said, and I quote, "Love we need a bug guy to come to the house baby ants on the kitchen table." I am not quite sure what he wanted me to do with this piece of information on a Saturday night. I mean, yeah, I am sitting here typing this on the kitchen table and there are baby ants crawling over my elbows. But I wasn't going to call the exterminator from the Hilton ballroom. On a Saturday night. Stay tuned for Clueless Husbands: The Interview. I'm serious. I'm going to find out, once and for all, what he was thinking. Wonderful! 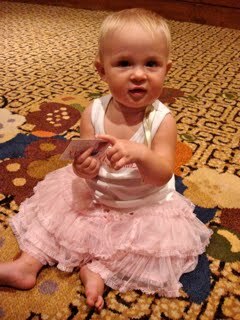 All the giving back going on at BlogHer. They auctioned off Voices of the Year artwork (words and images from various blogger posts, transformed into works of art) to raise money for The Nature Conservancy, which is doing all sorts of good for the Gulf. And then there was Tutus for Tanner. ..and kids, too. I don't think this baby had a blog, but I can't be sure. The brilliant and cool Catherine from Her Bad Mother has a nephew, Tanner, who is dying of Duchennes Muscular Dystrophy (DMD). Kristen at TheShredheads came up with the idea of Tutus for Tanner: She asked that anytime people ran a race, they wear a tutu to honor Tanner. 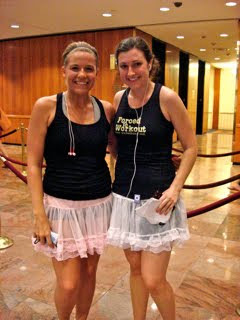 At BlogHer on Saturday morning, dozens of women participated in a Tutus for Tanner 5K. I saw Tanner at an event, and he's a sweet, handsome kid. It's heartbreaking. 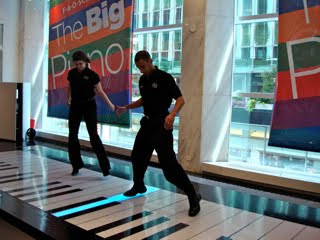 If you want to raise money for DMD research, you can do it here. Another nice giving-back thing: At the expo hall, where companies had booths, Todd Parr (a children's author who illustrates and writes whimsical, colorful books) was at Stouffer's promoting his new book Let's Fix Dinner, whose proceeds benefit Habitat for Humanity. I talked with him for a little while about doing a book for kids with special needs, and he said it's "high" on his list of books to write. Excitement! Weird! VERY weird! I met a blogger in the lobby of the Hilton. She asked what kind of blog I write, and I said it was a blog for parents of kids with special needs. "What's special about your son?" she asked. "He has cerebral palsy," I said. "Cool!" she replied, brightly. At least it was better than the "Awwww" response. I think? Wonderful! The inspiration at the sessions. The women of the panel Blogging Autism: Shattering Myths, Opening Eyes and Finding Your Tribe. I related to a lot of what was discussed, especially when Jean (far right) said that she assumed life as she knew it would be over when her son was diagnosed with autism. I laughed when Carol from Aspie Advocate, an adult with Asperbergers (third from left) said, "How do parents of unaffected kids do it!? They talk so much!" I cried at the "Grief, Loss, Tragedy and Community on the Internet" panel; afterward, I got a chance to speak with Anissa Mayhew. Some of you may know that Anissa had a stroke in November. She's come a long way, and still has a ways to go. I told her that Max had a stroke, and we talked a bit about some medical stuff. Anissa is totally funny—she had us laughing on a panel about grief. People flocked to see her throughout the conference. She's a goddess. I laughed a lot at the "Where's the Line or the Lie: Storytelling, Memoir and Poetic License" session, which featured Jenny from The Bloggess, one of my fave funny blogs. Someone asked about the arguments with her husband, Victor, that she freely posts about. She shared two rules: 1) Never blog when mad; 2) Never blog about real arguments. Also, it's not OK to make up stuff. I think this one took me approximately twenty hours, but I can't be sure. Weird! 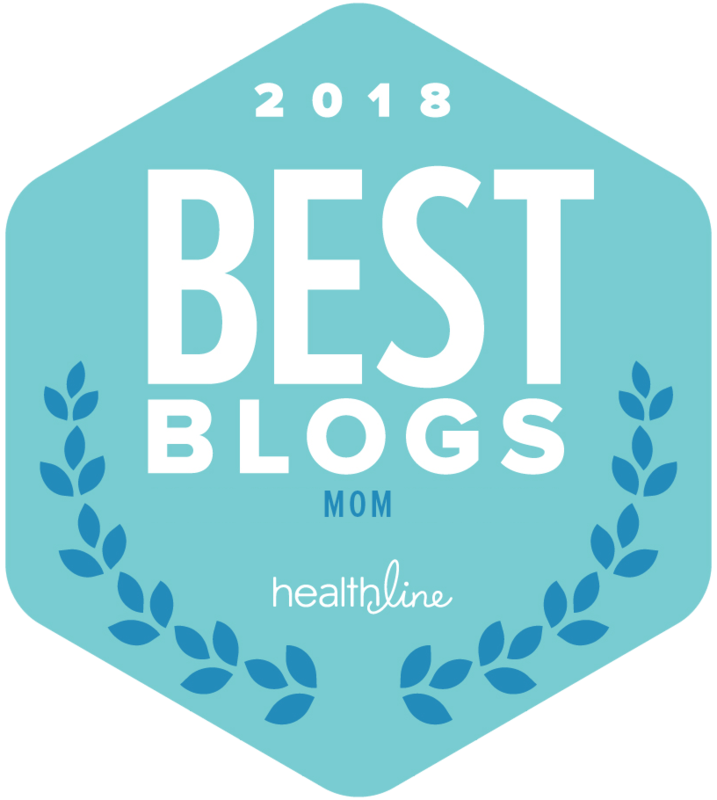 There were approximately 2500 bloggers at BlogHer, and I managed to keep bumping into the same three people: The ever-amusing Vodka Mom, Jessica from It's My Life everywhere and Jill from Scary Mommy. I think they thought I was stalking them but, hmm, could it be they were stalking me? Wonderful! 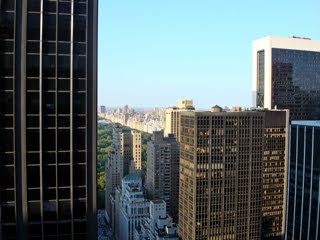 Hanging in the BlogHer Serenity Suite on the 43rd floor. This is the view that, for fifteen blissfully quiet moments, I had all to myself. Then a few people showed up and, happily, they were fun to hang with, including Stacy from Is There Any Mommy Out There? and her adorable Quinn; Christine from Coffees and Commutes; Corinne from Trains, Tutus and Tea Time; and Heather of The Extraordinary Ordinary. Wonderful! All the parties and events. 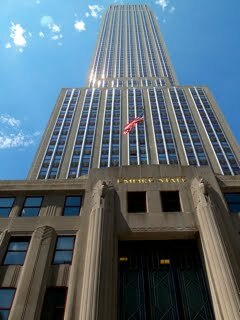 I got to ride a New York City double decker tour bus (something no born-and-bred New Yorker would typically ever do) and snap photos with a Kodak EasyShare M580, courtesy of Kodak, a camera that lets you share photos on social media sites with the click of a button. I hit the Avery SocialLuxe Lounge (that's The Bloggess at left accepting her "Funniest Blog" award from Megan at Velveteen Mind and Christine from Boston Mamas) and caught up with Kim from Traveling Mom and Barbara Jones, cofounder of Blissdom and head of One2OneNetwork. 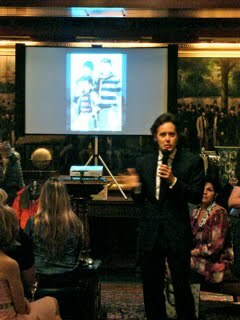 I was thrilled to hear David Lauren, Ralph Lauren's son, speak at company headquarters about its history and the Ralph Lauren Childrenswear line. 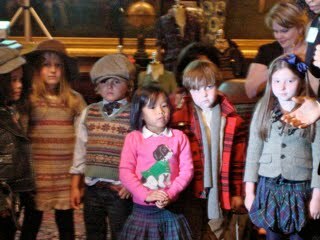 We watched a virtual storybook, The RL Gang—a video with super-adorable kids in super-adorable RL clothes ("merchentainment," as David called it), narrated by Harry Connick Jr. Check out the trailer (it'll be live on Ralph Lauren on Aug 18). There's also a shopable book of the same name; 15 percent of the proceeds will benefit the Ellis Marsalis Center for Music. These cuties star in the Ralph Lauren print ads. Man, I would love to see a kid with special needs in there; wouldn't Max fit right in? Yes, the room was a wood-paneled wonder, as you'd expect it to be. 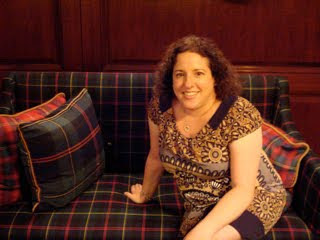 If I put a plaid couch in my living room, it would never look this good. Over the weekend I also had brunch with the lovely Shannon from Sprout TV, I got even more gorgeous (if that is humanly possible) courtesy of Audrey McClelland from Mom Generations and Vera Sweeney of I'm Not Obsessed!, and I got a little buzzed at the Mouthy Housewives party (thanks, Marinka). I went to the BlogHer parties Bloggy State of Mind, Sparklecorn and CheeseburgHer. CheeseburgHer had, you guessed it, burgers. And beds. 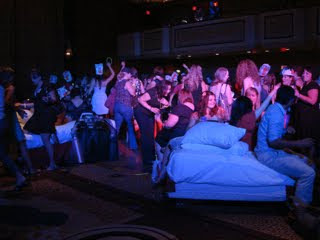 I really needed a nap, but nobody would turn down the music or get off the beds. On Sunday morning, I had a brunch at FAO Schwartz to celebrate Juno Baby, who's making adorable videos for kids (designed by Muppets creators) with original music. And, last, a gourmet breakfast (with sushi and ceviche) at the elegant Loews Hotel, organized by Carol from NY City Mama. Wonderful and weird! 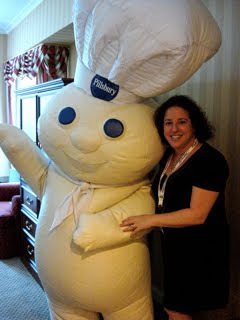 I got to meet The Pillsbury Doughboy. I'm not sure if Dave was more jealous of him or of Mr. March, the abs-flashing fireman. Note, I received products from events I attended above, but the opinions here are all my own. Labels: BlogHer10, why am I writing this at 2:00 a.m. Thanks for sharing your post, I missed cheeseburger fun to see your photo from it! Will you be attending Blogalicious in October? I had a great time and am looking forward to next year, but wow, am I glad to be home! It was great to meet you! Thanks for bringing us all together. BOF lunch was amazing. OH MY GOD! My kids LOVE the Pillsbury doughboy; they'd punch the living crap out of him (lovingly, of course) if they were ever in a room with him--though his size might be intimidating! They'd prefer one about three feet high, I'm guessing! What a wonderful conference. Isn't the internet something, I don't think anyone would have predicted that kind of a gathering twenty years ago. Ellen--don't have some a-hole who charges you a fortune come in to "do" those ants (and poison you and your kids)--you can do them yourself and so can Dave. Wipe down your counters/tables (and table legs) with vinegar (yes, vinegar--it makes the scent of the ant trail go away and the ants get confused). You can wash your floor with vinegar and water for the same effect; throw in a little peppermint oil for a nice smell (ants hate MINT too--so do rodents, plant it around your foundation and that fixes any mouse problem). Put a line of borax or paprika (great use for "tired" paprika) outside the door. Find the ant hills--either pour gallons of boiling water down 'em or use, yes, once again, vinegar. The trick is to find out where they are coming from, follow the trail, caulk if they're getting in through a tiny crack, and hit 'em where it hurts! Well I'm envous of you meeting both men - Mr. March the Fireman and "The Doughboy". Thanks for sharing. Lots of good reading for a "not the mama". It was so, so, so (yes, THREE so-s!) good to meet you. Thanks for your BOF lunch & just generally for being so awesome! Yes, to children with special needs in the RL ads. Yours and mine, 'k? Sounds like a fun time! I never even considered going because life is too hectic this year... but maybe next? My daughter has special needs and it would be great to find a community of bloggers that is going through that as well. Thanks for the recap. I'm living vicariously through you! Maya, hoping to make it to San Diego next year, too! Carrie: COME! Elizabeth: Home was just a quick train ride away for me but, yes, good to be here. 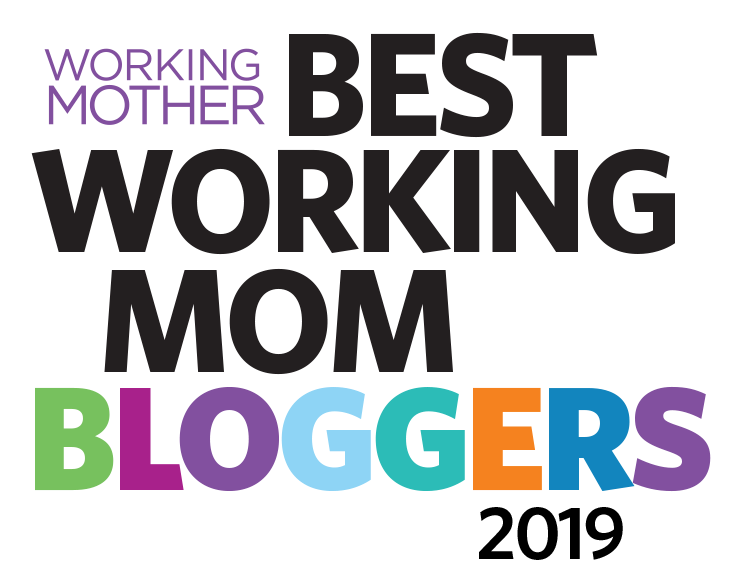 Tracy: I'll be at Blogalicious, I'm doing a workshop on blog writing. Kristen: Glad you liked the lunch! Felicia: THANK YOU, as always, for having some easy and brilliant solution. You are like Martha squared. Kate: Our kids would look great in those ads. :) And, no, YOU are awesome. Beth: For events I hadn't been invited to that I wanted to go to, I just asked, or friends asked for me. That sums up the whirlwind. It was lovely meeting you, I'm so glad you took a time out in the serenity suite. What a recap! Loved it! And I agree with Jill, loved, loved, loved running into you again and again! Hi, I don't think we may have actually met but it was good to hear your comment during the autism panel. Weird and wonderful the conference was, indeed! Looks like you had a great time - you deserve it. I loved the pictures etc. but my absolute favorite part of this post was the pie chart. Very impressive and I love how you even gave a mention to the baby ants in the chart!!! Not sure if I am more jealous that you got to meet the cute fireman or the Pillsbury dough boy!! Wow -- you did a LOT of stuff and even managed to remember it all. I'm ashamed to say that I didn't really know what Tutus for Tanner was all about until I read it here. That Duchenne's is such an SOB disease. My parents have always been active in the National Assoc. of Letter Carriers and the Muscular Distrophy Assoc. is their official cause so I met some kids with MD including Duchenne's growing up. So. Not. Fair. 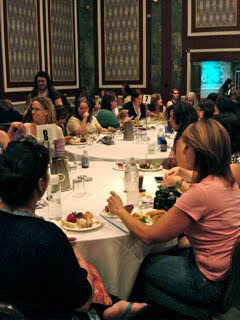 Thank you, thank you, thank you for helping to organize the Birds of a Feather lunch. 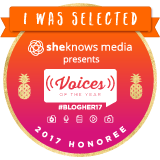 Truly, it was one of the highlights of my BlogHer experience ... to be in the company of so many others who GET IT and understand and know things without needing them explained. Thank you for that. I only wish we had more time to talk and become acquainted. (Guess that's what Google Reader is for, and you are now in mine.) Great to meet you, albeit very briefly! And my husband's crisis was, "Is the 2yo's toe broken?" It's OK though. It was resolved when I got a text that read, "found ped office. waited 20 minutes. 7000 sick kids there. toe looks fine. Got money back and left." As always, a pleasure to spend time with you! So is there an event like this that guys can go to and do manly type stuff? Thank you for the blog her recap. I always learn so much from you! and yes. I was TOTALLY stalking you. Birds of a Feather lunch sounds fabulous--sorry I missed that. Just reading your incredibly long list of activities makes me tired. In fact, it may be my bed time. So glad we got to know each other a bit. I'm looking forward to a long and loving "at least that one time IRL" friendship. So funny... I also kept bumping into the same few people -- including Scary Mommy! What a fantastic recap of everything. I can't remember enough to write such a detailed post. LOL about the baby ants... Ewww. That Birds of a Feather lunch was phenomenal. Thank you so much for putting it together. It just shows you how much us special needs bloggers crave our community. It's a really incredible thing. It was an absolute pleasure to meet you last weekend!! I came over here from a comment you made on Liza's blog. 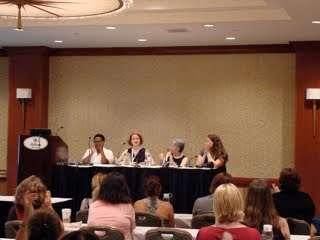 We were traveling in similar circles - I was at the panel with the Bloggess and the design one. 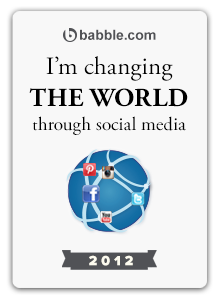 Even used a graph in my first post BlogHer post. ha ha. We met, briefly, after sparklecorn and cheeseburgher. I'm just now going through my cards and wanted to say hi. I've been surfing online more than three hours today, but I never discovered any interesting article like yours. bloggers made excellent content as you did, the web will probably be much more helpful than ever before.